As this week begins, the legislative outlook for regulatory reductions looks like it may be coming to a standstill. Although SB 1562 had its first hearing and passed favorably through that committee, the companion, HB 1397, did not get a hearing before the House committees stopped meeting. This means the bill is probably dead for the 2009 session, which is discouraging news for the many FHCA members who have been working hard on eliminating duplicative inspections. FHCA doesn't stop working on its legislative priorities until the session comes to a close, so be sure to check back for updates soon. Representative Denise Grimsley (R-77) unveiled her strike all amendment to HB1209, related Nursing Programs, during yesterday’s State & Community Colleges & Workforce Policy Committee meeting. This is the companion bill to SB 2284, sponsored by Sen. Mike Haridopolos (R-26), that we mentioned last week. Clearly the Representative has been working hard with the nursing organizations and schools, because everyone seemed happy about the amendment to the bill. The amendment would maintain the Board of Nursing’s role in approving nursing programs while removing their subjectivity and rule-writing authority. The amendment also allows for an increase in the teacher-to-student clinical ratio from 1:12 to 1:18 in some cases. The bill, as amended, was passed unanimously, and we congratulate Rep. Grimsley for her leadership. Wednesdays are always busy health care days in the Capitol, but as nearly 100 FHCA members descended upon the halls, it soon became apparent that their presence was not one to miss. The Lobby Wednesday group this week included representatives from Districts 4, 5 and 11, FADONA, Sea Crest Healthcare Management, as well as PPS Results Group, an FHCA associate member. Legislators did not let them down as the Senate Health Care Regulation Committee kicked off the morning hearing SB 1562 by Senator Mike Bennett. As expected, the Long Term Care Ombudsman spoke against the bill, stating the health care of residents is up to the Ombudsman and that the Ombudsman program has changed the persona of nursing homes due to the care that these volunteers provide to residents. FHCA Chair Deborah Franklin followed with passionate testimony about her 25+ years in long term care and the focus she and her fellow providers in the audience have on quality of care and quality of life for residents. She took time to thank the Ombudsman volunteers who do spend time in facilities advocating on behalf of residents, but noted that the administrative assessment has evolved to duplicate the inspection AHCA is already conducting on facilities through its certified team of nurses, dieticians, life safety experts, etc. The passage of 1562 will help the Ombudsman refocus their role back on resident advocacy and provide them more time to spend in the facilities, speaking with residents, family and staff about the important role they play in resolving resident complaints. FHCA is thankful to Senator Bennett for the great job he did in responding to this issue and correcting the record, and the bill passed favorably out of the committee, 7-1. Later in the day HB 433 passed the House Health Care Services Policy Committee, with only seconds to spare at the end of the meeting. This bill creates a "therapeutic formulary" for nursing homes, similar to that used in hospitals. The House Health Care Regulation Committee also approved HB 1097, which begins the implementation of electronic records in Florida. The Shady Ladies Are Back! On Monday, six family members from Shady Rest Nursing Home in Ft. Myers arrived in Tallahassee to spend three days visiting legislators in support of long term care and FHCA's 2009 legislative priorities. FHCA members might remember these folks from the 2007 Annual Conference when they supported their administrator, Wes Edwards, as he received the Arthur Harris Government Services Award. Unfortunately Wes was unable to join them for this visit, but these folks have had a successful trip to Tallahassee, busily working the halls of the Capitol and making lots of visits to their legislators. Their stories are amazing, and I enjoyed speaking with them Monday evening when they stopped by the FHCA headquarters for a legislative briefing. This year the group includes two men, so we might have to coin a new name for them. Regardless, their impact on legislators cannot be minimized. What a great idea-thanks to Shady Rest. FHCA staff and lobby team members have spent the day meeting with the Agency for Health Care Administration, AARP, trial attorneys, Senators and their staff to provide more information about SB 1562 before it comes up in the Senate Health Regulation Committee meeting at 10:15 a.m. on Wednesday. Postponed after last week, we expect it will be heard tomorrow despite the crowded agenda. Many FHCA members are in town this week, along with FHCA Chair Deborah Franklin, who will testify in support of the bill. Watch for more details soon. Late last Friday (Friday the 13th), the Office of Economic & Demographic Research released the results of the General Revenue Estimating Conference held that day, lowering the expected General Revenue projections again. Projected General Revenue collections for the current Fiscal Year 2008-09 were $1.1 billion below the amounts used for the January Special Session, and projected General Revenue collections for Fiscal Year 2009-10 were reduced by an additional $2.3 billion. So, for Fiscal Year 2009-10, Florida is expected to have slightly less than $20 billion in General Revenue to spend. This amount compares to $27.1 billion available for the Fiscal Year 2005-06 budget period. What this means is that after the funding of the minimal “must funds,” such as Medicaid workload and maintenance of effort, education, and prisons, the projected deficit for Fiscal Year 2009-10 is approximately $6.1 billion without consideration of Federal Stimulus funds. After application of the Federal Stimulus funds available to the state of Florida, the deficit is reduced to $3.1 billion. Given Florida’s constitutional mandate to have a balanced budget, the legislature will be charged with finding an additional $3.1 billion in additional cuts or revenue enhancements. As a result, today the Senate Health and Human Services Appropriations Committee required each of the agencies for which they have jurisdiction to present options to achieve a 10% budget savings. Foremost among the options presented by the Agency for Health Care Administration was a proposal to reduce nursing home Medicaid rates by 12.1 percent, which equates to $357 million ($115.5 General Revenue) in reduced funding. This would equal approximately $22.75 per Medicaid patient day. AHCA also included options to expand the Capitated Nursing Home Diversion Program by another 1,000 slots, saving $14 million ($4.5 million General Revenue), and the elimination of adult Dental, Visual and Hearing Services, saving $30 million ($9.6 million General Revenue). Clearly draconian cuts of the nature being discussed would be totally devastating to our profession. Now is the time for FHCA members to let legislators know how difficult it is to survive the March Medicaid rate reductions of an average of $14.77 and what a cut of $22.75 per Medicaid patient day would do to your ability to care for Florida’s frail and elderly residents. Of note, the proposed cuts would threaten the employment of over 10,000 nursing home workers and exceeds the entire amount of funding provided under the provisions of SB 1202, which increased Certified Nursing Assistant staffing from a regulatory requirement of 1.7 hours per patient per day to 2.9 hours per patient per day. How can providers be expected to maintain the quality of care improvements that have been made with such a loss in funding??? In yesterday's meeting of the Senate Committee on Health Regulation, attendees were not lacking for an exciting give-and-take over SB 2284, related to nursing programs. SB 2284, which is sponsored by Sen. Mike Haridopolos (R-26), repeals the authority of the Board of Nursing to approve programs for the education of nurses. While the nursing curriculum design would still be determined by the Board of Nursing, the school licensure process would be moved to the Department of Education or the Commission for Independent Education. People in support of the bill asserted it was needed since current Board of Nursing policies and actions create unnecessary barriers to expanding nurse education. Opponents of the bill declared that removing the approval authority from the Board of Nursing could result in inadequately trained nurses. The contentious issue seemed to break down along the lines of schools which support the bill and nurse organizations who are against the bill. In the end, the bill passed with a 5-3 vote. Well, it is Wednesday again. After a busy Tuesday preparing material for our largest group in town for Lobby Wednesday so far, FHCA staff kicked off the activities with a Lobby Tuesday briefing for nearly 70 members from Cypress Health Care Management and Gulf Coast Health Care. On Wednesday, representatives from FHCA's District 12 in Pensacola and District 13 in Ft. Pierce, as well as Good Samaritan Society, also took part in legislative visits at the Capitol. All total nearly 150 nursing home owners, administrators, nursing staff, social workers and other caregivers took part in the day's activities. Wherever I went throughout the Capitol today, I saw FHCA members. Many of them thanked me for the great orientation provided by FHCA staff, stating how comfortable they felt visiting their legislators. So as you can see, anyone can do it! On the calendar for today was SB 1562, sponsored by Senator Bennett, which reduces many duplicative regulatory activities. Time ran out before that bill or SB 2286, which is the Agency for Health Care Administration's deregulation bill sponsored by Senator Gardiner, could be heard. We can only hope they are on the agenda for March 25th. On the House side today, the House Health Care Regulation Committee passed HB 651, sponsored by Representative Matt Hudson, which is the companion AHCA deregulation bill. FHCA supports this bill which eliminates unnecessary paperwork and gives nursing home staff more time to focus on resident care. I testified on behalf of FHCA members noting that, while we supported the bill, we were concerned about the elimination of the Quality Monitors and would hope they could be retained to focus on problem facilities. The Committee also passed HB 433, sponsored by Representative Roberson, which creates a formulary system for nursing homes similar to the one presently used by hospitals. So, it was a good day for FHCA, and along with so many great members in town and the sun shining upon us, we continue to work on behalf of long term care providers tomorrow and every day thereafter. Is it really only week three? This week will be one of FHCA's busiest, with more than 100 members from nursing homes across the state expected to descend upon the Capitol for our Lobby Wednesday. In addition to watching the budget-which is not looking good-there are two important regulatory bills which FHCA supports that will be addressed during the same committee meeting on Wednesday. There has been lots of press surrounding SB 1562, sponsored by Senator Mike Bennett, which eliminates several duplicative surveys and procedures. The bill will be amended on Wednesday to fix several problems created during the bill drafting process. One of the most important issues in the bill for long term care providers is the removal of the administrative assessment by the Long Term Care Ombudsman. The elimination of the assessment does not, however, prevent the Ombudsman from continuing to do his or her most important job, which is to advocate for residents at any time needed. Keep watching FHCA's legislative blog for updates during the week, and be sure to tell your friends to sign up to follow. In typical fashion, the legislature is ending week two with appropriations meetings both on Thursday and Friday. Most committees are still in review mode, looking at the Governor's proposed budget, as well as dissecting the budgets for the state agencies under their review. One rumor that is still active is the merger of the Agency for Health Care Administration and the Department of Health. We'll continue to watch this issue to see how it unfolds. The Senate Health and Human Services Appropriations Committee held a ½ day meeting today on numerous health care programs under its jurisdiction. The audience, numb by endless presentations from Agency staff, perked up when Senator Peaden concluded the meeting by directing all health agencies to submit a plan to the committee for its next Thursday meeting that will reduce their next year budget by 10%. Along with our Lobby Wednesday participation from Life Care Centers of America and the FHC Activity Coordinators Association, as well as the activities related to Ambassadors for Aging Day, FHCA staff and lobbyists tracked a number of bills. These bills related to reorganizing the Department of Children and Families (SB 1986), finalizing the Silver Alert Grant Program (SB 1330) and Electronic Health Records (SB 162). The last bill is one we are very excited about, as we know many of our members are moving into the electronic age. Wednesday was also Catholic Days and the traditional Red Mass was held last night. This mass is for legislators to ask for guidance during the legislative session ahead. Finally, I was excited to see a group from Emerald Shores in special t-shirts and enjoying the singing and dancing taking place in the Capitol Courtyard. This facility is one of our FHCA members and had come to town with residents and staff to enjoy Ambassadors for Aging Day. Thanks to them for making the trip and being part of all the excitement at the Capitol. Today, FHCA met with hundreds of Florida seniors who passed through the halls of the Capitol for Ambassadors for Aging Day. The event was a great opportunity for elders and elder advocates throughout Florida to showcase the special contributions of older adults to legislators. FHCA helped to sponsor the event, which included health screenings, exercise demonstrations, a number of elder-related exhibitors, performing artists, music and entertainment. 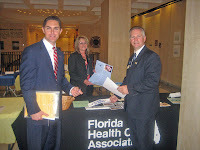 Several FHCA members from Life Care Centers of America and the Florida Health Care Activity Coordinators Association, who were in town for the Association's Lobby Wednesday activities, stopped by the booth and helped us promote the important role of long term care providers in our state. During today's committee meetings, FHCA staff monitored several bills of interest to nursing home members, including the major Workers' Compensation bill, HB 903, which was discussed but retained by the House Insurance Committee. As such, it will have to be heard again if it is going to move. Health care issues on the agenda today included HB 753, which urges Congress to continue funding of the Silver Alert program, HB 767, which allows for the combination of mental health services and substance abuse services at one time, and HB 109, which allows certain medical professionals to violate confidentiality if necessary for someone's safety. FHCA will be tracking the progress of these bills throughout the legislative session, and as always, long term care providers can stay up-to-date on the Members Only Legislative Section of the FHCA Web site. The weather in Tallahassee took an upward turn and so did the heat in the Capitol. This is the week when suddenly everyone realizes that it's time to get their bills moving or their amendments filed, and as a result the pace quickens. Activities at the Capitol today included the "Officer Down" memorial, which moved everyone on the outside plaza, and the farmworkers also gathered in the halls promoting their issues. Also on tap this week is Catholic Days, with the traditional Red Mass being held so legislators can pray for spiritual guidance through the upcoming session. Wednesday is Ambassadors for Aging Day, and FHCA will be one of the many organizations promoting services for Florida's seniors. That same day, FHCA will have a dedicated group of members in town for our Lobby Wednesday activities, where they'll have an opportunity to meet with legislators and talk about our important long term care issues. Stay tuned for more information as we continue to track the issues that impact long term care providers, including the beginning of budget negotiations, ongoing negotiation of our legal reform bills and fine tuning of the regulatory reduction bill. You can stay up-to-date on these and other critical issues that impact long term care on the Members Only Legislative section of FHCA's Web site. 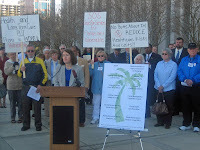 On Wednesday, FHCA Executive Director Emmett Reed joined representatives from AARP, the Florida Association of Homes and Services for the Aging, the Florida Council on Aging, Children's Home Society, Florida Coalition for Children and other organizations to urge lawmakers to enact long-term solutions to put the state back on track for a bright future. The press conference was organized by Florida's People, Florida's Promise, a coalition of more than a dozen organizations who speak on behalf of millions of Floridians representing all ages, incomes and conditions. Leaders of the groups noted that even though recent federal aid will help ease the state’s immediate budget crisis, Florida needs lasting revenue solutions that will bolster the state’s economy and make the state an attractive place to live. Three possible revenue solutions for lawmakers to consider include an increase in the state cigarette tax, a review of state sales tax exemptions periodically and the collection of state sales tax on purchases made via the Internet, catalog sales or telephone hotlines. Continued cuts to critical health and human service needs could hurt Florida’s families, businesses and its ability to recover from the economic downturn. As we look at the calendar for the end of the first week, the Legislature will be spending today and part of Friday listening to presentations by the Governor's staff on his recommended budget. You may recall that the Governor's budget is one part of the three-legged stool. There is also a House and Senate budget coming, which should all be reconciled by the end of the session. In addition, the House continues its discussion on the elimination of some sales tax exemptions, which has been an ongoing issue that is still not settled. For example, if you buy a U.S. flag, pole and hardware, the entire purchase is tax exempt. If you buy the flag in the morning and go back later for the pole and hardware; however, the flag is tax exempt but the hardware purchase is taxed. Yesterday, the House Appropriations Committee on General Government and Health Care heard testimony from Dyke Snipes, Medicaid Director for the Agency for Health Care Administration on the enhanced Medicaid Federal match (FMAP) contained in the Economic Stimulus Law recently passed by Congress. Dyke provided the criteria Florida must meet to qualify for the enhanced match, which would result in the state's FMAP increasing from 55.4% to 67.64%. In the 2008-09 Fiscal Year, this increase would provide Florida with an additional $953 million, or $661 million in excess funds after fully funding Medicaid, including caseload increases. Dyke stated this $661 million can be freed up for any other purpose by the Legislature except placement in reserve or rainy day funds. This initiated a number of questions from legislators, such as whether funds can be used to increase reimbursement rates or if it could empty the wait lists for Home and Community Base waiver programs, and "yes" was the answer to all. In 2009-10 FY, the increase will be $1.169 billion or $646 million of additional funds after fully funding Medicaid programs. This was the first good news for legislators who fear they will have to make massive cuts to health care services. In complete opposition to HB 535, which was passed yesterday by a House committee after much discussion and riddling, the companion Senate bill, SB 456 sponsored by Senator Don Gaetz (R-4), passed its first committee, Senate Children, Families and Elder Affairs, with not a question or comment. It will be interesting to watch these bills progress, and FHCA members can stay up-to-date through our weekly legislative updates on the FHCA Members Only Legislative Page. Earlier today Sen. Nan Rich (D-34) was selected to be the leader of the Senate Democrats in 2010, making her the first woman to hold the position of minority leader in Florida. Sen. Rich is recognized for her commitment to children and senior citizens and has always been a strong advocate for FHCA's issues and the long term care residents served by our members. If you're in Sen. Rich's district, be sure to congratulate her and thank her for her continued support of FHCA. More great news in Tallahassee today. Rumor has it that President Obama is going to announce that Florida's Division of Emergency Management Director, Craig Fugate, is being tapped to head the Federal Emergency Management Administration. Fugate has run the Division since 2001. If confirmed by the U.S. Senate, Fugate would replace acting FEMA director Nancy Ward as head of the agency, which employs 2,600 full-time staff and has more than 4,000 stand-by disaster employees. This decision reinforces the recognition Florida has received as a result of our success during the 2004 and 2005 Hurricane seasons. FHCA is very excited about this opportunity for Craig. HB 185, sponsored by Rep. Matt Hudson (R-101) regarding access to health care, was heard in the Health Care Regulation Policy Committee yesterday afternoon. The original bill as filed had one provision that established a 10-member Dental Health Access Task Force to make recommendations on the following Medicaid dental related issues: reimbursement; provider enrollment; maximization of dental funding by other states; claims processing; establishing temporary assistance to dental offices in the event of unexpected death of a provider; and creating a process to address patient behavior in dental offices. A strike-all amendment, filed by Rep. Hudson, removing the task force language from the bill was introduced and passed unanimously. FHCA was supportive of this provision, and we’re not sure why it was removed. We will continue to watch the Senate companion bill, SB 702 sponsored by Sen. Don Gaetz (R-4), to see what happens. Freshman legislator Rep. Brad Drake (R-5), got his due ribbing when HB 535 was heard at the Health Care Services Policy Committee yesterday afternoon. Supported by FHCA, this bill provides for a memorandum of understanding between law enforcement and receiving facilities, and many committee members had questions regarding some of the terms used in the bill. After a lengthy discussion, the entire committee voted against the bill. Rep. Juan Zapata (R-119) , however, called for reconsideration and, in a second vote, the bill was unanimously passed on to the next committee. Senator Ronda Storms (R-10) has just filed SB 2634, which includes a provision to require a search of the FDLE Sexual Predator database to be conducted on prospective or newly-admitted nursing home residents. FHCA will be tracking this bill closely and keeping members up-to-date on its progress. Watch your local public television station today to see the opening festivities of the 2009 Legislative Session at the Florida Capitol. Lots of people, lots of flowers, lots of traffic and lots of pictures abound in Tallahassee, which is tradition. The House and Senate do their formal installation duties this morning, and then the Governor will share his State of the State message later this evening. Committee meetings start this morning, and FHCA will be tracking several bills that impact long term care in Florida. Remember to visit the Members Only Legislative Section of our Web site to stay up-to-date. On Friday, February 27, Florida Health Care Association (FHCA) member Lisa McGinley of Brynwood Center in Monticello joined FHCA Executive Director, Emmett Reed, and several FHCA staff members to meet with U.S. 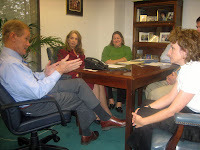 Senator Bill Nelson (D-FL) at his Tallahassee office. The meeting provided an excellent opportunity for the Association to discuss the critical federal issues that impact long term care in Florida, including the arbitration, the Employee Free Choice Act (or card check) and the Stafford Act. The group also provided the Senator with a historical timeline of how nursing home quality has steadily improved in Florida since the passage of landmark elder care reform in 2001, which mandated increasing minimum staffing requirements up to 2.9 CNA hours of care per resident, along with tougher regulation, quality improvement and risk management programs. The recent creation of the Quality Assessment Program during the 2009 Florida legislative special session helped nursing homes avert significant, increased funding cuts by allowing the state to draw down more federal dollars to fund nursing home care. Discussions with Senator Nelson also surrounded the anticipated influx of federal stimulus dollars through the passage of the American Reinvestment and Recovery Act of 2009 and what that means to long term care providers and the residents they serve in Florida. Mr. Reed, Ms. McGinley and the others shared with Sen. Nelson that the Florida Health Care Association and the members it represents will be urging legislators during the 2009 regular session to preserve Medicaid funding to support the 2.9 hour staffing mandate and ensure facilities have the resources needed to not only continue providing quality care, but also to make much-needed renovations to aging facilities, modernize health care settings through health information technology and meet the growing demands of Florida’s aging baby boomers through a strengthened health care workforce. Great news kicked off the start of the 2009 Legislative Session. Representative Esteban Bovo (R-110) withdrew HB963, which would have established "granny cams" in Florida's nursing homes. Thanks to the many FHCA members who contacted Rep. Bovo to let him know the serious side effects that such a policy would have had on the privacy of other residents, staff and families.